CIA makes mistakes. It happens. I try not to give them a hard time over it, because I make mistakes everyday. Sometimes, though, the Agency is just so unnecessarily petty and acting in such transparent bad faith, while also being demonstrably wrong, that it’s hard not to call them out on it when the . ty persist in their wrongness. 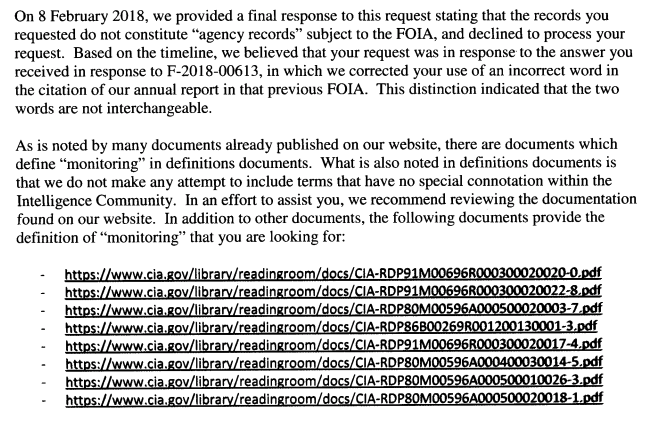 In January 2018, I sent a FOIA request to CIA for “information related to a “website maintained by open government groups and FOIA advocates to spot developments that affect CIA’s public access programs” as well as CIA’s monitoring of it, as officially disclosed in Central Intelligence Agency 2017 Chief Freedom of Information Act Officer Report for Fiscal Year 2016.” The report from the following year repeated the assertion, though in the plural. CIA’s interest in the FOIA community is naturally of interest to the FOIA community, hence the FOIA request. Since CIA insisted there was a distinction between these terms, and that they “followed” a website rather than “monitored” it, another FOIA request was filed – one for materials specifying the Agency’s use of the two, “distinct” terms. The Agency responded by claiming that the records were not “agency records” and thus were not subject to FOIA. This assertion was laughably wrong that it naturally prompted an appeal. In response, the Agency said that there was no right to appeal their assertion (which they would proceed to accidentally admit had been factually inaccurate). They did, however, apologize and attempt to clarify their previous letters from both FOIA requests. According to the Agency, the intent of their letter from January 26th had been for “clarification.” The Agency asserted that I had “wrongfully quoted” their report, which had indeed (and somewhat nonsensically, as one can follow trends or physical objects, but not a website) said “followed” rather than “monitored.” The problem with this assertion from the Agency is that it’s wrong. CIA then managed to contradict itself – and expose its previous FOIA rejection as inappropriate and inapplicable – in a span of three sentences. The Agency referenced their assertion that the records “do not constitute ‘agency records’ subject to the FOIA.’ Three sentences later, the Agency conceded that there are, in fact, “many documents” in CIA’s possession and subject to FOIA which include relevant definitions. The Agency helpfully provided URLs to several documents that prove their assertions were incorrect, both about the existence of the records and the distinction between the terms. 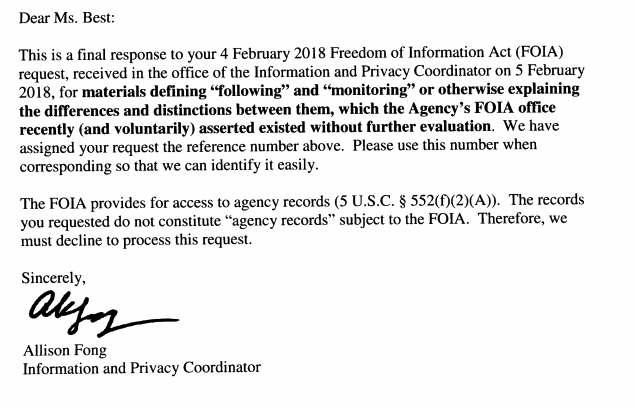 These documents would constitute “agency records” subject to FOIA even if not on their website, but their publishing them on their website removes any doubt. In one respect, the Agency was correct – the terms are distinct. In every other respect – their use of the terms, their insistence that there were no agency records, their claim of having been “wrongfully quoted” – the Agency could hardly have been more incorrect. Does any of this, in itself, matter? Insofar as it shows the Agency’s pettiness, their refusal to admit they were wrong, their blatant bad faith and refusal to perform searches for records they, mere sentences later, admit exist (and thus are subject to FOIA after all), it’s very relevant. 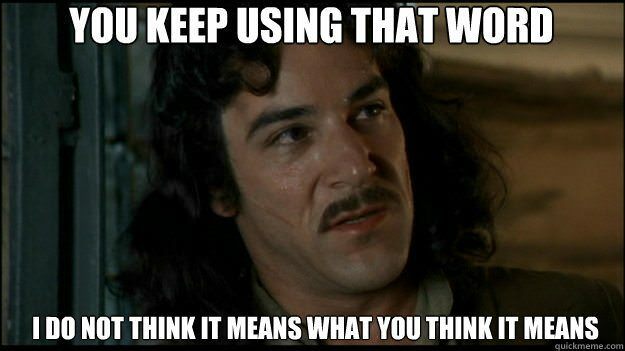 In responding to a FOIA request, the Agency went out of their way to start an argument by insisting that I had used the wrong word (with the most generous reading of things being that it was a distinction without a difference), then went so far as falsely accused me of having “wrongfully quoted” them. This pushback, petty arguing and false statements from CIA were made not in response to digging into a secret program, or contradicting a narrative published on the Agency’s website, but for asking the FOIA office for records created by the FOIA office about a FOIA-related website which CIA’s Chief FOIA officer boasted that the office regularly visited as part of their outreach. Imagine how it would have gone if it had been for something the Agency hadn’t boasted about for years. So are they all, all honorable men.